Including this one. While no direct historical evidence exists that describes the origin of this ancient road, it is generally understood that traders and smugglers carried countless goods over this pass during the days of the Roman Empire. Interestingly, if you follow this road over the next pass into Switzerland, then you’ll cross a high point called Monte Moro, a name which also speaks to the region’s strong connection with the Moors. There is a story that when the Moors invaded the Valais in the year 939, the King of Arles accepted these warlike people on the condition that they defend the mountain passes against his enemies. The Moors made Almagel their headquarters, (today called Almagell), and left arabic sounding place names like Mischabel and Allalin. The Mattmark too, home to a great watering hole on the way down way to Saas Fee, owes its name to the Arabic term Matmar, which literally means “Moors Meadow.” The meadow is now long gone, flooded beneath the waters of an impounded river, but the name exists just the same. 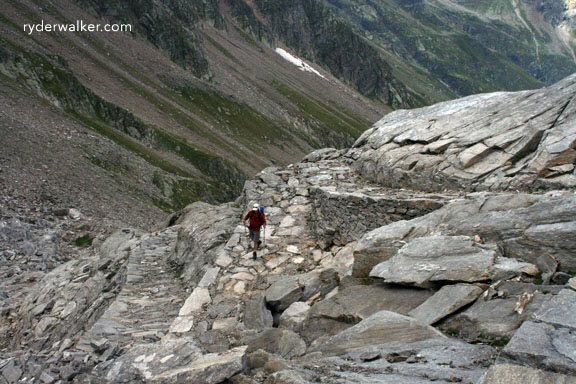 Etymology aside, this path connecting Alagna and Macugnaga, Italy has been around for a long time, and if you follow it far enough, you’re sure to end up in Rome.